While the others were dropped from the program, three women stayed in the school all spring and summer, through the mountains and swamps, through the sleep deprivation and grueling hikes. Then, in August 2015, after three attempts at the first stage and a single attempt at each of the others, two women made history: 26-year-old Capt. Kristen Griest and 25-year-old Lt. Shaye Haver became the first females to graduate Ranger School. That left only Maj. Lisa Jaster—a graduate of West Point, an Army reservist, an engineer at Shell, a 37-year-old mother of two young children and a CrossFit athlete. Jaster recycled the Mountain Phase once, and she was also sent back to the swamp along with 20 other men to repeat the third and final phase. In October 2015, Jaster graduated after spending six months away from her family. this will be important to my children, for them to know that I stood up for something,” Jaster said a week after graduating. 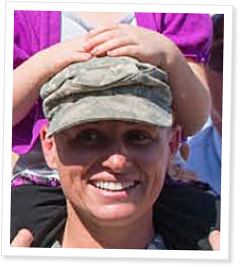 Jaster earned her Ranger tab and is now reunited with her family, but she’s faced criticism from those who oppose women in the formerly male-only institution. Here, in an exclusive interview with the CrossFit Journal, Jaster talks about that criticism, how CrossFit helped her prepare for Ranger School and what kept her motivated to finish.